The Carlson Small Portable Dog Cot is a multi-functional cot style bed for your small dog who needs a safe, comfortable place to rest. 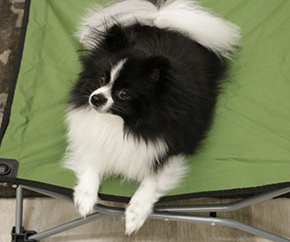 Setting up in seconds wherever or whenever you need it, the 26” long portable pup can hold small breeds effortlessly. An essential item for home, travel, pet day care, picnics, and camping - the portable pup was designed for easy transportation. Sturdy canvas material lines the dog cot, reinforcing the edges for added security and comfort. The fold-and-go design of the portable bed is ideal for the adventurous family that still wants to include their pup! The Carlson Small Portable Dog Cot is made entirely of steel to handle the everyday use of your pet. Made from a sturdy canvas material, the bed liner includes reinforced stitching for added security. We understand you’re busy, so wasting time assembling products is not an option. To keep it simple, we designed the portable dog bed to set up in seconds and fold down compactly with a single motion. To open from the closed position, just push down on the sides until it fully stretches out. To fold, just grab each side and push in. It’s that simple. Whether your dog is at home, at doggie day care, in a hotel room, spending time at the park or camping for the weekend, the raised dog bed is perfect for indoor or outdoor use. The portable bed comes with a carry case to make traveling a breeze. Weighing just three pounds, the bed is designed to handle up to 45 pounds and measures 26”L x 26” W x 9” H, making it ideal for small breeds. The go-anywhere portable dog cot folds to a fraction of it’s size, which is perfect for traveling. It can even fit in a standard sized suitcase, so everyone can have their own sleeping space when spending the night away from home. Because we know dogs have a tendency to make a mess, the Carlson Small Portable Dog Cot is made from heavy-duty, waterproof nylon. The liner cleans up quickly with a damp cloth and soap to keep the bed clean and sanitary. The Carlson Small Portable Dog Cot is backed by a manufacturer’s limited 90-day warranty. Carlson’s products are designed specifically for your pet and suit all breeds and lifestyles. How Far Can I Walk a Puppy? As such small and not-so-coordinated creatures, it can be tough to know how much walking and exercise your growing puppy needs. 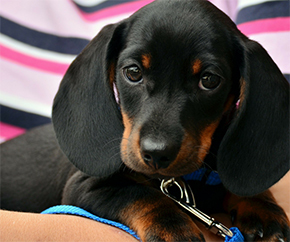 We provide a basis for how far you can walk a puppy and what you can expect from them. Training your dog for recall is the most important command a dog can learn. If you’re in the process of training your dog for recall, these tips will help your dog come every time you call. 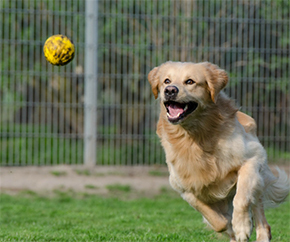 Whether you own a 5-pound Chihuahua or a 150-pound Great Pyrenees, all dogs need regular exercise. Here are some fun and rewarding activities you can do with your dog in this short amount of time. Sign up to receive dog-loving deals and information. © 2019 Carlson Pet Products.